Are contact lenses and sport compatible? Anyone in doubt as to the effectiveness of contact lenses in correcting sportspeople's vision need only speak to Jay Gibbons, a major league baseball star who plays for the Los Angeles Dodgers, in the US. "It was night and day from the time I put them in," he said recently of a new pair. The 34-year-old outfielder told the LA Times how, thanks to an improved contact lens prescription, his recent vision problems were finally behind him. He had previously complained of lenses popping out during games, but since discovering they were of both unsuitable size and an inaccurate prescription, he is back in the game and able to see clearly. Evidently, there are sports professionals who swear by contact lenses. Some would argue, however, that the rough and tumble of athletic pursuits raise questions about the practicality of eyewear. Most would agree that contact lenses are a more viable – and perhaps cost-effective – solution for sportspeople, particularly since spectacles present a more cumbersome target for stray tennis balls and flailing hockey sticks. Having said this, lenses are not without their own unique negatives. Lenses can, under sufficient pressure, detach themselves from the wearer, causing problems and discomfort for the second half of the match or race. Canadian athlete Paula Findlay found this out the hard way recently, when one of her usually-dependable contact lenses fell out during the opening women's race of the International Triathlon Union's championship series in April. Luckily, the mishap didn't stop Ms Findlay claiming victory, but it certainly highlights the problems that can arise for those relying on glasses and contacts while competing in sport of any kind. It is an issue that was also brought to light by the American Academy of Ophthalmology in April, designating it Sports Eye Safety Awareness Month. 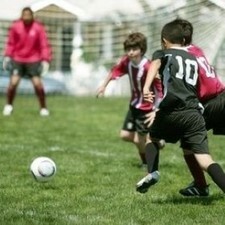 The academy noted the fact that around 40,000 sports eye injuries occur annually in the US. The majority of those affected by such incidents are children and teenagers, many of whom go on to endure lasting visual impairment. Dr Francis D'Ambrosio, a specialist surgeon and medical director of D'Ambrosio Eye Care, offered a simple solution that could prove particularly helpful to sporty individuals who wear contact lenses. Protective eyewear can either be worn in place of spectacles – provided they incorporate the lens prescription – or simply be worn over the eyes as a plain-glass barrier to prevent contact lenses being knocked out. "Athletes need to choose and wear proper protective eyewear because eye injuries can be devastating, not just career ending, but life changing. Eye injuries are one of the leading causes of visual impairment in children," said Dr D'Ambrosio. Sports enthusiasts can now choose from a wide range of sturdy, lightweight and fashionable protective eyewear. D'Ambrosio Eye Care claims that properly-fitted polycarbonate lenses should not hinder physical performance and could prevent up to 90 per cent of sports eye injuries. "Children and adults can end up with injuries ranging from abrasions of the cornea and bruises of the lids to internal eye injuries such as retinal detachments and internal bleeding. Unfortunately, some of these athletes end up with permanent vision loss and blindness, 90 per cent of which is preventable through the selection and wearing of proper eyewear," reiterated Dr D'Ambrosio. While contact lenses clearly present a number of benefits over cumbersome – though all too often fragile – spectacles when involved with sports, even lens wearers need to keep safety at the front of their minds. There is no reason why contact lenses should not be compatible with rough and tumble activities, though younger sports fans in particular are urged to don protective eyewear in order to stay safe from eye injury and keep enjoying their game for many years to come.